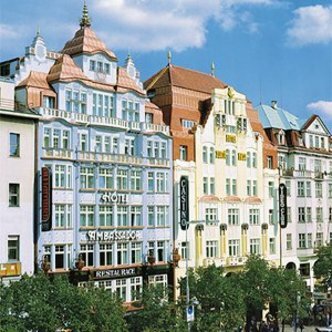 Welcome to the 5star TOP Hotel Ambassador Zlata Husa, built in 1920 in the Art Nouveau style on the famous Wenceslas Square directly in the centre of Prague. Our tastefully furnished and comfortable rooms are all air-conditioned and have private marble bathrooms with jacuzzi bath and shower. All rooms are equipped with minibar, SAT TV, direct dial phone allowing conference calls with up to six persons, fax, internet access, safety deposit box and hairdryer. The TOP Hotel Ambassador Zlata Husa is renowned for its great restaurants, cafes and bars. The Lobby bar, the luxurious Halali Restaurant, the traditional Pilsner Restaurant and the newly opened Ambassador Sushi and Thai Bar - all offer excellent fare for discerning gourmet. For our conference guests we offer a wide range of meeting and conference facilities that can accommodate up to 1500 people. Each meeting room is equipped with modern business technology for the ultimate in comfort and convenience. For those who cannot imagine their relaxation without sporting activities, the hotel has a gym with exercise equipment. An experienced masseur and attentive beautician will help you keep in shape. There are also hydrojet, floating, solarium and cosmetic services on offer at the beauty parlour. Within the calmness of the luxury Ambassador Thai and Wellness Club you will find a complete range of exclusive massages and treatments. Amongst them, Thai Massages, carried out by genuine Thai professionals, Indian Ayurvedic massages and a range of other treatments, relaxing baths and beauty wraps. In the comfort of our luxurious treatment rooms each with its own suite bathroom an exceptional experience awaits you. For your entertainment the VIP Club Casino and Goldfingers nightclub are open all night and day. We have just one wish - to invite you to our hotel and spend some unforgettable days together with you directly in the heart of the ancient city of Prague.